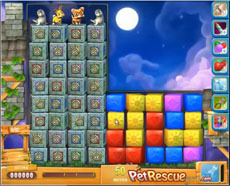 Start clearing the blocks in the right part of the level in order to activate the mesh mash booster twice, to smash the wires of the blocks. After that the only difficult point of the level is the number of moves you’ll have at your disposal in order to rescue the demanded number of pets. If stuck on Level 483 you should spend a moment to watch our walkthrough video!